In November 2015, I pulled the plug on social media — Twitter, Facebook, LinkedIn, Blogger. Then I went beyond that. I limited my use of e-mail, kept the TV off during the day (until my partner came home from work and turned it on), sent few text messages and, when I wasn’t working at my day job, kept my mobile on ‘Do Not Disturb’ mode. I went dark, off the grid. This was, in part, inspired by a story I’d read two years earlier about a family that decided to live like it was 1986 again. No computers, internet, or cell phones. And they dressed the part, too, with mullets and cut-off jeans. They brought 1986 to the 21st century to embrace the simplicity of that era. That said a lot, to me anyway, about how we’ve evolved — and the role technology has played in that evolution. Would I want to return to 1986 (I was thirteen then)? Probably not. While I didn’t go to that extreme, I required a much-needed timeout from social media because I felt overwhelmed. At that time, I was working on the rewrite of a novel and trying to stay current on industry trends. Suddenly, I felt like everything was coming at me fast and furious. On Twitter, Facebook, LinkedIn, or my inbox, the bombardment was unrelenting: ‘advice’ on holiday book marketing, or writing and selling your novel, or how authors can use Facebook Lead Generation Ads, or how to grow your followers, et. al. Overwhelmed, I couldn’t hear myself think, didn’t know how to proceed. Being overwhelmed had a spiraling effect. I don’t know how to move myself forward, couldn’t concentrate, and then procrastination set in. And boy, oh, boy, did I embrace procrastination! Frustrated (and it was all my own doing) because I wasn’t making progress, wasn’t pushing the boundaries, wasn’t bringing my writing projects to completion. Everything stalled, and I was left flailing. So, I went dark, off the grid. For two weeks. Now it’s 2019, and I haven’t gone off the grid again. As a self-published author, I recognize and appreciate that social media — Facebook, Twitter, Instagram, etc. — can be powerful tools in the promotion of my author brand. It’s still not something that comes easily or naturally to me, but I’m grateful for the exchanges on Twitter and Facebook that connect me with other writers/artists facing similar challenges. Holed up in my own world, I’ve become part of a community that supports and encourages each other. And it’s great to connect with readers, too. Social media has a way of sucking you into the vortex. A decision to check in ‘quickly’ on Twitter can blow apart your day. 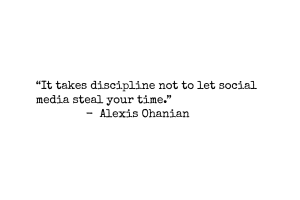 That’s why social media is both my friend and my enemy. I took the timeout because social media felt more like my enemy. My enemy. Because, real or imagined, some days social media has dominion over me. Am I engaging enough? How many likes did my post get? Has anyone responded on Facebook? I get all worked up about if I’m doing it right, if I’m doing what I should be doing to be successful (if I’m listening to all the expert advice out there). The social media world is constantly evolving. Late in 2018, as I started to catch up to some changes that had occurred in recent months — and realized I was far behind in the game — I panicked. I felt like I immediately had to get up to speed. Overwhelmed, I couldn’t think, couldn’t focus and, worst of all, couldn’t write. I took a day and a half to step back, breathe and then come up with a plan to move forward. When I went dark three years ago and pulled away (briefly) from social media, I was happy with the results. I wrote. More focused, my productivity skyrocketed. That meant I ran more, and got out of the condo to explore my neighbourhood, discovering new restaurants and shops. 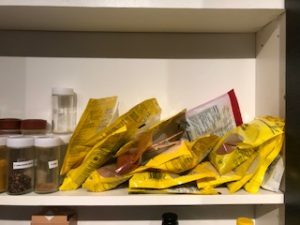 I read more, challenged myself in the kitchen and organized my spice cupboard (the latter is back in a state of disarray). I felt relaxed and, at the end of each day, a sense of accomplishment. Something I hadn’t felt in a long time. The exercise made me realize, as an indie author — or any artist these days — you can’t bury your head in the sand when it comes to social media. But you still don’t have to let it rule the day. Yes, writers like Stephen King, Paulo Coelho and Jodi Picoult use social media (and brilliantly at that), but if you asked them I bet they’d tell you they had a plan for social media management. You need a plan, too, but one that you’re comfortable with and let’s you pursue your creativity your way. It’s a little like writing or painting or making music … you have to find your voice. In December 2018, I realized I needed to make changes to my daily schedule if I really wanted to achieve my goals. At the end of the day, I didn’t feel fulfilled … like I had squandered the time gifted to me to live out my purpose. I wasn’t tending faithfully to my dreams. That need for change led me to read books by Brendon Burchard, Brené Brown, Michael Hyatt and Keith Ellis — so I could be inspired to do what was necessary to live my best life ever. I was excited, energized, pumped. But nothing changed. Why? I couldn’t break the cycle of self-sabotage. After all these years, I was still afraid of what people would think of me for daring to be a writer. That they’d ridicule me (which people did and still do) when I talk about my dream of writing full-time. “Stick to what’s safe,” they told me. Or, “How many books have you sold?” they’d ask mockingly. “I could never do that.” And I took their fear and owned it. In January, working the flight to London, something felt off. Usually excited to go to London, I felt numb. Listening to my colleagues talk, a calmness invaded my heart. I went quiet. I realized this wasn’t my dream. Sure, it’s great to travel the world. Having 13-14 days off each month? Freakin’ fantastic. Great benefits? Absolutely. Starting my day in the middle of the night, stuck with rude passengers and colleagues at 35,000 feet for hours, and beyond exhausted for 24-36 hours after returning home? Not my dream. It was time to start marching to the beat of my own ambition. I didn’t quit my job. I focused on expressing my truest voice instead of constantly giving myself over to distractions and unfulfilling activities. On the top of my hitlist? Social media. I have an active presence on three social media platforms: Twitter, Facebook and Instagram. That is the order I give them priority. And now, each network gets only 10 minutes a day of my time. How do I do that? I use Screen Time, Freedom and StayFocusd. Screen Time: Available on iOS, it lets me set a daily allotment of time for each app. When the allotted time runs out, access to the app is blocked. Be aware, though, that it’s easy to ignore the limit set, so it also requires self-discipline. Freedom: This app allows me to block websites as well as apps on my iPhone for the time period set (make sure you create a block list). StayFocusd: A Google Chrome extension, it allows users to limit time spent on certain websites and block access to the internet (Nuclear Option). Three apps, using them 10 minutes a day, produces the 30-minute-a-day social media diet. That’s how, finally, I’m mastering my day, taking control of the agenda and direction of my life. Do you have a plan for social media management? How is it working for you? Click Reply or leave a comment in the section below. I’d love to hear from you. During a trip to London in November, I had to do something out of the ordinary: find a post office open on Sunday to mail a package for a friend. I found one not far from my hotel, downloaded the route from Google Maps, then set out. It took me a moment to recognize the outlet since the postal services were offered inside another shop. The packaged mailed, I then walked to the Marks & Spencer (M&S) on Edgeware Road. For some reason, I never bothered to check the M&S store hours and assumed — like their competitors Tesco and Sainsburys — it’d be open early. Not so. On Sundays, M&S doesn’t open until noon. I checked the time. 11:22. Could I kill forty minutes? Exhausted from being up all night, all I wanted to do was pick up some food and then head back to my hotel room to crash. I went first to Tesco, then Sainsburys, but they didn’t have anything on offer that appealed to me. Even though my stomach rumbled (and shopping when I’m starving is dangerous), I opted to wait for M&S to open. I ventured over to Paddington Basin, where a scene from the last Jason Bourne movie had been filmed, and grabbed a coffee from KuPP. Sitting by the canal, I pulled out my iPhone and, in between sips of coffee, started fooling around with the video. If you’re blogging or on Instagram, uploading video content is all the rage at the moment. I’m not a filmmaker, and don’t have any such ambition. But exploring this ‘new’ medium gave me that … I don’t quite know the word. It sparked something inside of me. It made me curious. Heading to M&S on a high, I realized what was happening. I was taking a risk, doing something outside of my comfort zone. It was the artist in me taking control. And when you take risks, new doors open. The new door that opened turned out to be Black Sweater Talk, a weekly video blog I share on Facebook. I took a risk, did something out of the ordinary … and this is what it looks like. I hope you’ll check it out! 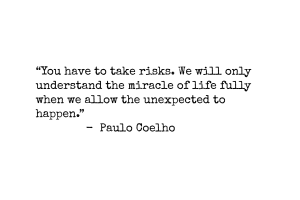 Have you taken a risk lately? How did it make you feel? Click Reply or leave a comment in the section below. I’d love to hear from you. Something ‘magical’ happened a year ago. Then, however, I didn’t know how much it would change my life, how much it would change the script. On 17 January 2018, I stopped drinking. I need a moment to let that sink in. I’ve been sober for one year. 365 days. 8,760 hours. 525,600 minutes. “Why?” many of my friends asked with bewilderment as much as curiosity. I stopped drinking — not because I was pressured to, not because I didn’t know my limit, not because alcohol was ravaging my life — because I had to get my house in order. Call it an aha moment, a day of reckoning, an epiphany. Naming it isn’t important. But to fulfill my calling and be of service, things needed to change. To keep moving in the direction of my dreams, I had to clean up my own backyard. Sometimes life speaks to you, yet you purposely ignore what her advice. That was me. By the end of 2018, I’d spent the previous two years on autopilot. Doing the same things over and over again, moving forward yet never feeling like I was getting ahead. Then ending up exhausted and tired of being in my doctor’s office, wanting to know why I wasn’t just sick but still sick. Tired of complaining of fatigue. Tired of the long bouts of insomnia. Headed for some type of breakdown, it was time for an intervention because I wasn’t ‘happy’ with my life. I wasn’t where I wanted to be or living the life I’d imagined. And if I wanted to bring that vision to life — and not end up stranded or stuck in the same old patterns — something had to give. The past year without alcohol has been like living in a state of grace — honouring who I am and not who others wish me to be. I’ve been, more than ever, committed to the thing that has called me into service: writing. Every day I write, show up to practice my art and hone my skills. 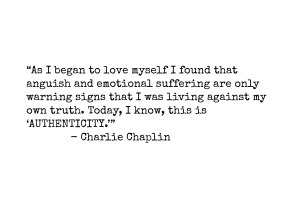 Every day I’m being true to who I am. Beyond living out my calling to write, going sober has helped me to take better care of myself both physically and mentally. 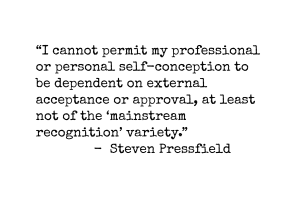 I’m more present, more aware of who I am, what I want to achieve and what I must do to accomplish my goals. I have more energy to get through the day. I’ve lost just over 20 pounds and, through a more challenging running schedule and by paying attention to what I eat, I’ve kept the weight off. Simply put, there is more clarity — of purpose, of what I’m seeking to do and give back to the world. The journey forward may still not be easy, but I’m in it for the long haul. Sober, I have the greatest chance of living my best life. Sober, the world will see the truest expression of who I am. Sober, I’m headed for my best year ever. Is there one change you could make that would set you up to live your best year ever? Can you commit to making that change now? Click Reply, or leave a comment in the section below. I’d love to hear from you! I have a driver’s licence, but it’s been over five years since I’ve sat behind the driver’s wheel and navigated a car through the streets. There’s no need for it. Living in downtown Toronto, everything I need — grocery stores, banks, the public library, restaurants — is within walking distance. And choosing to get around the city on foot keeps me active as part of a healthy lifestyle. It also reminds me that sometimes, charging through life, the best approach is easy does it. Easy does it, though, was hard advice to swallow when I finally learned to drive a standard. The jerky movements, the black smoke that one time billowed out from underneath the hood, the embarrassment of not being able to get it right. One morning especially. I just couldn’t get the coordination right and, struggling to shift gears, the car got stuck in reverse. After a few unsuccessful attempts — and feeling like a failure — I called a friend for help. There will be days when we feel like we’re stuck in reverse as we pursue our creative dreams. (I’m in one of those periods now, trying to figure out the next right thing to do without driving myself crazy.) No forward momentum. No obvious signs of success. And no third-party validations. We’re on a journey and, one step at a time, we’ll get to our final destination. Don’t necessarily expect an easy ride. Just be ready — and committed — for the long haul. Are you feeling stuck? What’s the one thing you can do right now to move forward? Do that one thing now, then click Reply, or leave a comment in the section below, to tell the world all about it. When is Your Most Productive Time to Create? The ticking of the wall clock in the living room. Outside, the rumble of cars on the nearby Gardiner expressway. The staggered snore crashing through the bedroom wall into my office space. Apart from those noises, it’s quiet as I sit down to write. Of course, it’s 4:00 am and most normal people are in bed. But I’m not ‘normal’ … don’t really think I’ve ever been. Being up in the early morning hours for me is perfect, though. It’s an awesome time of the day when I can hear myself think. It’s just me and the words flowing through me. It’s a little slice of heaven here on earth. It’s my most productive time to create. While I’ve always been a morning person, it took time to figure out when I did my best creative thinking. I had established a writing routine, which always started early in the morning. But I also had to learn to write anywhere and at any time if I wanted to finish a project. I didn’t want to be the author who took ten years to write one book. So, when I was trapped in the nine-to-five world, I wrote on my lunch hour and again after work, holing myself up in a local coffee shop. I wrote in airport lounges and on the train. I didn’t have any more excuses. I wasn’t waiting for inspiration. What I’ve learned over the years is that the early morning, as the rest of the world is still lost in their dreams, is my most productive time to create. It’s the time when I can quickly produce a draft, hold my focus as I rewrite a challenging scene, see what’s working in a piece and what’s not. It’s when I’m at my best, when there’s clarity in all things. Take a moment to look at your day — the moments when you’re creating and see if you can pull out when you’ve been the most prolific, the most juiced. Was it in the evening, the afternoon or at one o’clock in the morning? Where were you? In your home office? At the local coffee shop? In bed? When you’re able to pinpoint that moment in your day when you’re doing your best work, and then stick to it, you’ll feel like providence just moved. You’ll feel like Stella, and you’ll get your groove back. Things change. When I first found my most productive time to create, it was in the morning, between nine and noon. I don’t know why, but after a while that period became less productive for me. It was too easy to be pulled away. If it was sunny, I’d go for a run. The traffic noise seeping into the condo frustrated me. Friends who had the day off would text, “Let’s grab lunch,” and I’d bolt out the door. Learning to focus on what matters most, I started getting up earlier. Nowadays, I’m up around 3:30 or 4:00 am, and quickly get into the ‘zone’ that has my pen gliding across the page or my fingers dancing across the keyboard. If you see your creative production slide, maybe it’s time to re-examine your schedule and change things up. It may help you get back to basics, help you to push on and finish something. When is your most productive time to create? Hit Reply or leave a comment in the section below. I’d love to hear from you.